These days, everyone knows about Michael Carter’s unusual origins, but back in ’86, we were all just in love with the collar. 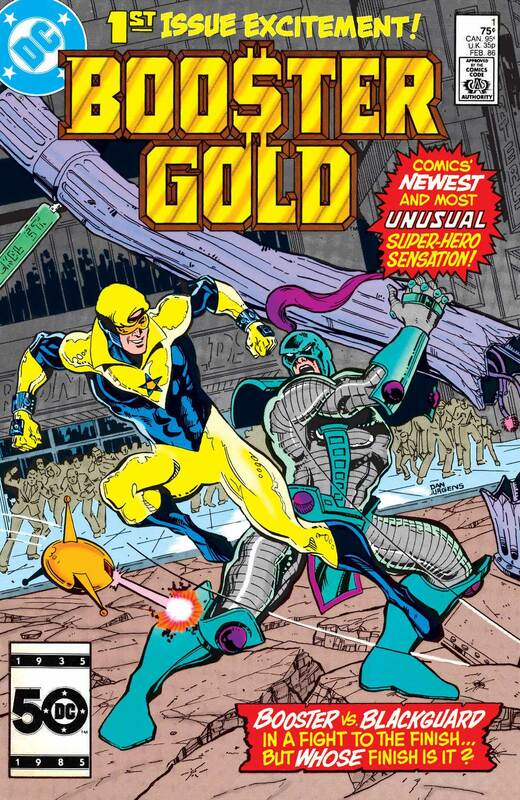 Your Major Spoilers (Retro) Review of Booster Gold #1 awaits! 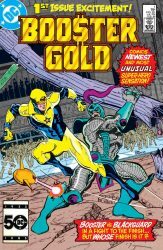 Previously in Booster Gold: When my daughter suggested that I review the first appearance of Booster Gold (after his cameo appearance in ‘Teen Titans Go! To The Moves’), I was a little surprised, and my first instinct was to say that he just wasn’t old enough yet. Then I realized how long about 1986 would have been, and my brain had one of those late-40s shutdown moments where I refused to accept the passage of time. Once the blue screen cleared, I remembered picking up this comic off the stands back in high school, but the question remained: Why did my brain think of him as an entirely modern creation? As this issue opens, we see the beleaguered editor of Blaze Comics desperately trying to boost his sales with the “Next Big Thing”, only to see a headline about the newest hero in Metropolis: Booster Gold! We find the hero in question negotiating his movie deal at the gym, all the while arguing that he’s a much bigger draw than we know him to be. (It’s his first appearance, after all.) 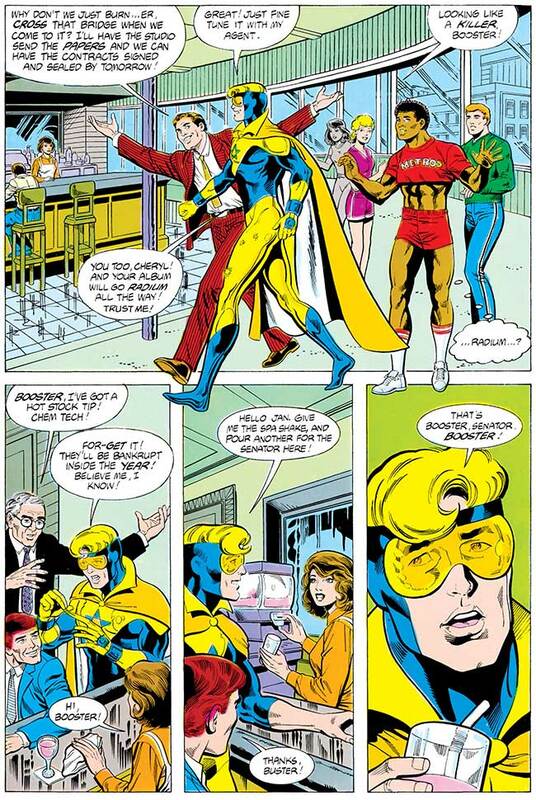 Once he gets the five MILLION buck figure that he wants, Booster changes into his work clothes, and we get the first appearance of the rarely seen Booster Cape! Personally, my only real complaint with the cape is that it’s color doesn’t really with with the rest of the costume, matching only his goggles. I’d have gone with a blue cape and a matching gold lining to offset his suit. But, y’know, hindsight is 20/20. 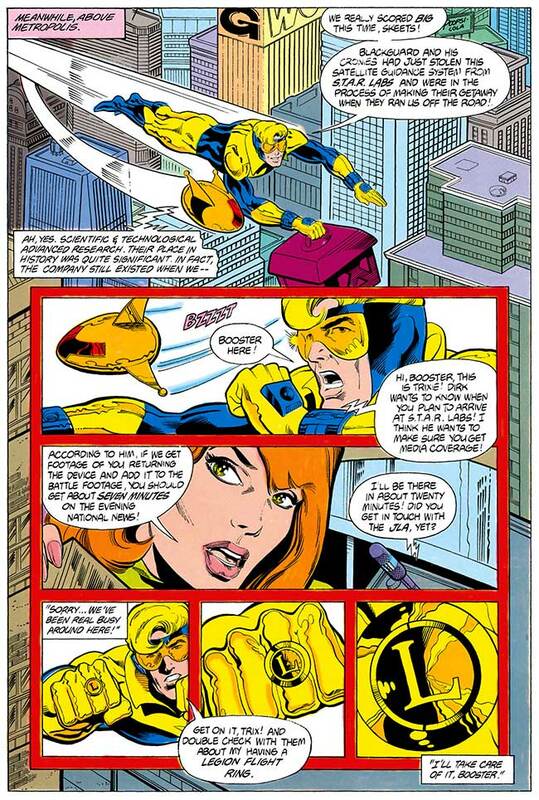 We also get the first indications that something is up with Booster, with a few strange turns of phrase in his interactions indicating that he may be a bit out of place. He also takes the phrase “shake a leg” literally, then tries to play it off as a joke. As mysterious men follow him around and try to ascertain his identity, Booster calls his secretary at Goldstar, Inc. to see if the Justice League has gotten in touch about membership yet. That’s when he encounters his first crime! A group of thugs is robbing STAR Labs and their hired muscle, Blackguard (pronounced “blaggerd”, if I recall ‘My Fair Lady’ correctly) is more than happy to beat him senseless to cover their escape. It’s in this action sequence that the inking of Mike DeCarlo (who is/was a very talented man and who adds a lot to stories like The Spectre’s run in ‘Adventure Comics’ and tons of Archie content) is wholly unsuited for the pencils of young Dan Jurgens. You can see Jurgens fluid anatomy trying to break through, but Dan’s strong inks are just too much, leading to some awkward panels like the first one seen here. Booster also shows more powers in this first issue than I remember him having, like his “Mass Dispersal” field, which allows him to essentially teleport a thrown car (!) back at Blackguard. Booster maneuvers Blackguard into an electrical terminal, which knocks him out and wins the day, allowing our hero to grab the stolen whatever-it-is and return it to STAR Labs. 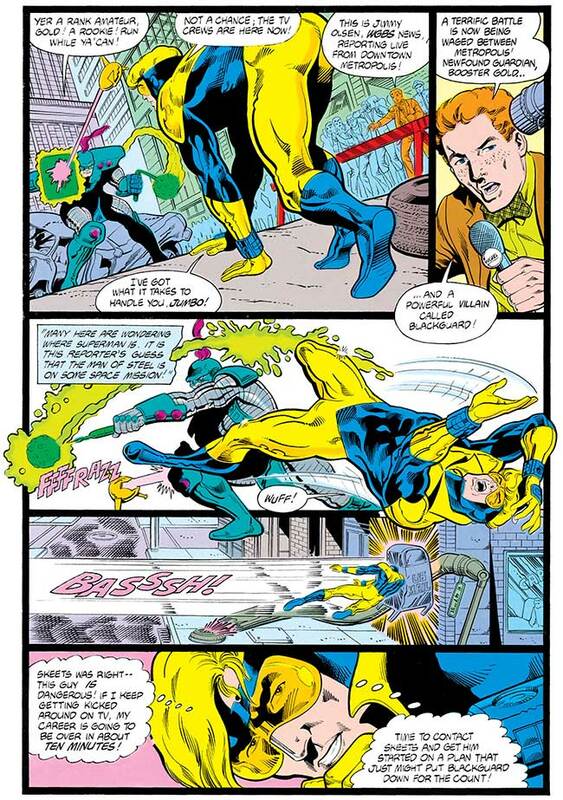 That’s when we get the biggest hint as to Booster Gold’s true origin, as he reveals the source of one of his powers! After calling in the media to cover his heroics, Booster returns the secret science thingy (it’s not fully described here and I can’t recall what it actually was) only to get ambushed and left on the ground. As the issue ends, every television reporter in Metropolis has a perfect vantage to watch the newest hero of the city get utterly defeated. The biggest part of my inexplicable surprise at remembering that Booster is, in fact, three decades old is how modern this story feels. It presages a lot of what would become Image Comics, with the public hero interested as much in his Q-rating as his actual deeds, as well as his focus on profits. There are also many veiled references to needing to learn the idioms of his new home and one moment where Skeets openly tells Booster that he needs to be aware of “this time” and how people act, setting up the big moment down the line where we discover that he is…. FROM THE FUTURE! Booster Gold #1 is still a good read, though, setting up a mystery that works even when you know how it is resolved, providing a cool new costume and a hero well ahead of the pop culture curve plus setting up a rich and interest cast, earning 4 out of 5 stars overall. 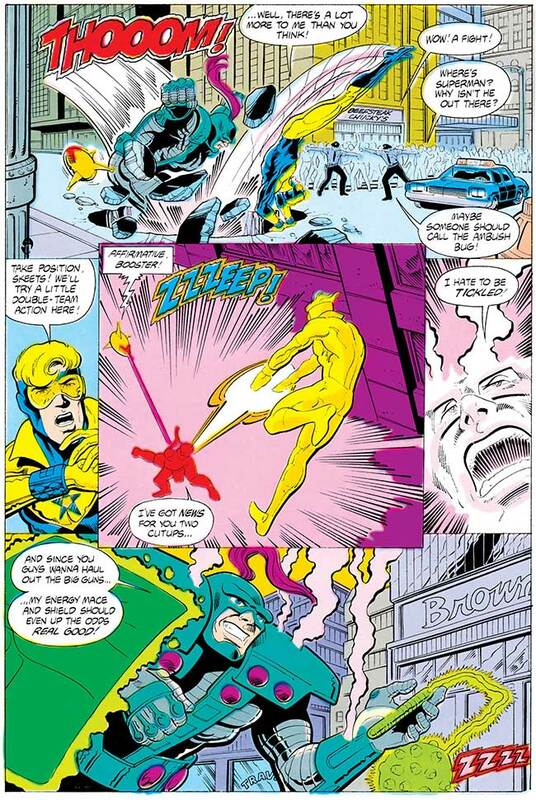 The two big shames of it all are how quickly all of this ends up falling apart (things get really bad, really quickly for Booster, including a big reveal in ‘Millennium’) and the fact that modern takes omit the popped collar, which is absolutely necessary for balance in Booster’s excellent gold battlesuit. 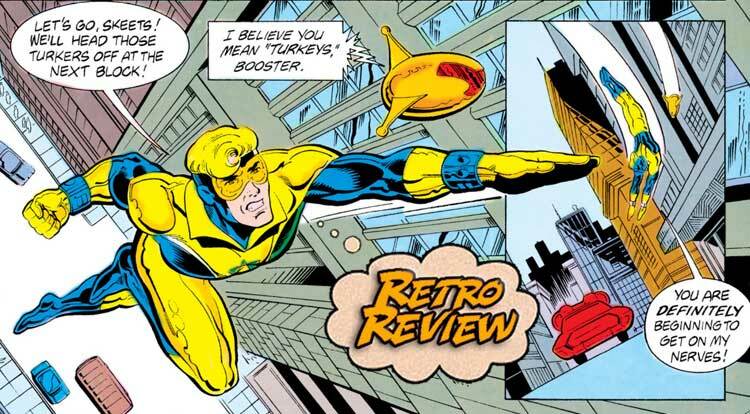 Even an inexperienced writer and a mismatched inker can't dull the fun and enthusiasm of this issue, and Booster has one of the rare perfect costumes in comics.